A - The Discovery Channel and its lesser edutainment progeny are a bit like eccentric Victorian naturalists, disseminating wonders and grotesqueries for an ecological spectacle that would made Barnum proud. This, perhaps more than the Bowdlerization or Disneyfication of Nature, is one of the more unfortunate legacies of the nature documentary. Art has receded in favor of the accumulation of curious factoids and gruesome oddities for their own collectible sake. Thank God, then, for Werner Herzog. The German director has spent decades carefully building his cynical credibility. As a result, he can approach the natural world with the same awestruck notes as any Discovery feature, even as he pushes beyond the banal limits of such fare in the pursuit of something more probing and, well, visionary. This makes it all the more strange and delicious that the cable network produced his latest feature, Encounters at the End of World. This exploration of the landscapes, creatures, and people of Antarctica is as magnificent as nature documentaries come. Encounters elicits authentic chills of astonishment and reverence with its marriage of sights and sounds, and then uses that emotional toehold to thrust us into familiar but always disquieting Herzog thematic territory. What drives humanity off the edge of the map? In a twenty-first century bedeviled by possible environmental calamity, will we find salvation there or just auguries of doom? Encounters is a beautiful film. No, scratch that. It's downright gorgeous. It more than fulfills its promise to show us vistas unlike any we've seen before. Many filmmakers, even very shoddy ones, can mate shots of natural beauty with swelling choral music to attain a faux solemnity. Herzog, however, achieves such a union so damn well, and with such a clear distaste for cheap sentiment, that his solemnity arrives with a gleam of legitimacy, not to mention dark veins that trace to deeper, rougher musings. When Herzog comments, in that appealing Teutonic cadence of his, that divers gliding through the frigid polar ocean remind him of astronauts, it's not merely an observation. He not-so-subtly claims the heroism of space travelers on behalf of the scientists he profiles. Moreover, he ponders why we as a species, and these people in particular, are drawn to the last unconquered realm on the planet. Or maybe not so unconquered, for as Herzog reminds us, there is little true exploration to be had in the world anymore, even at its basement. Perhaps that's why Encounters also suggests that Anarctica represents something more than territory to be claimed and carved up. It is a place where all the final mysteries of the natural world seem to huddle, calling out to researchers in biology, geology, and physics. It's also a place of dreams and madness, a flytrap that collects survivors, wanderers, oddballs, and second- and third-chancers. Everyone that Herzog encounters—forklift operators, vulcanologists, plumbers, hermited penguin watchers—seems to be waiting for something. Whether that thing is the Big Score of the con-man or the Big Answer of the sage remains ambiguous. Regardless, the thousand strange souls dwelling in McMurdo Station and points beyond seem to expect that their Grail will tumble out of a hole at the bottom of the world any day now. Ever alert for mush-headed Big Ideas, Herzog nevertheless seems to find something marvelous and inspiring about these people. He lingers on them, long after they have elucidated their research or told their rambling stories. It's as if the director is trying to catch them in a moment when the pretense drops away. When it doesn't, when it becomes obvious that Antarctica's cold burns away pretense, that her people are exactly what they appear to be... well, one almost senses a ghost of a smile on Herzog's lips. Encounters is less sour and more somber in tone than the admittedly magnificent Grizzly Man. There Herzog discovered endless layers to fearless fool Timothy Treadwell. Here he marvels not so much at Antarctica's complexities and contrasts, but its sheer inpenetrability. 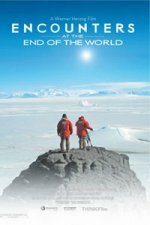 Although a glaciologist cautions that this continent of ice is a dynamic, living thing, Herzog nonetheless conveys it as a vast, eternal monolith, one defined primarily (in the film at least) by its alluring and yet pitiless power over humans. This theme of the polar waste as a siren is reinforced by repeated invocation—often via consciously quaint historical footage—of early twentieth century expeditions to the continent. Yet the film returns time and again to the possibility of Antarctica as oracle, a place where dedicated seekers might find secret knowledge, and this idea exhibits a magnetic pull over the film. Of course, Herzog, being who he is, always has questions, doubts, and suspicions. Even as he gapes at the eerie beauty of the undersea vistas, there's always that lingering curmudgeon impulse. It's the same one that ultimately decided that a grizzly bear's face held only stupid hunger, rather than animal wisdom. It's the same one that deservedly dwells on Encounters' most chilling image: that of a disoriented penguin, waddling off not towards its nesting grounds or the sea, but to the mountains and certain death.